SELMA, Ala. (AP) — Thunder rolling above Brown Chapel AME Church, Democratic presidential candidate Cory Booker warned Sunday of a looming threat to American democracy and called for protecting the legacy of the civil rights movement with love and action. “It’s time for us to defend the dream,” Booker said in a keynote speech at Brown Chapel, which two generations ago was the starting point of a peaceful demonstration in support of voting rights that ended in beatings on the Edmund Pettus Bridge. The infamous “Bloody Sunday” on March 7, 1965, galvanized support for the passage of the Voting Rights Act that year. “It’s time that we dare to dream again in America. That is what it takes to make America great. 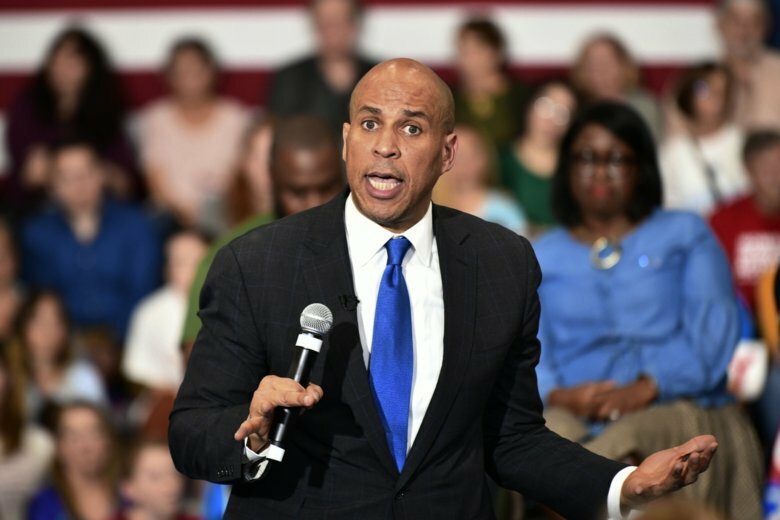 It is up to us to do the work that makes the dream real,” said Booker, a New Jersey senator and one of three White House hopefuls who participated in events commemorating the march. Also visiting Selma on Sunday were Sens. Bernie Sanders of Vermont and Sherrod Brown of Ohio. Joining them was Hillary Clinton, the Democratic nominee in 2016. Booker and Brown, along with Clinton and civil rights leader Jesse Jackson, marched with dozens of others Sunday afternoon to Edmund Pettus Bridge. Sanders had left for a campaign event in Chicago. The throng of marchers had set out from the church and sang freedom songs under a stormy sky as they headed to that sacred spot over the Alabama River to commemorate the peaceful protesters who were met with tear gas and clubs wielded by state troopers. This year’s commemoration came in the early days of a Democratic presidential primary campaign that has focused heavily on issues of race. Several candidates have called President Donald Trump a racist, while others have voiced support for the idea of reparations for the descendants of enslaved black Americans. Booker and Sanders have already announced their campaigns. Brown is still considering a White House bid. The three gathered for a unity breakfast in Selma to pay homage to its civil rights legacy and highlight how the movement shaped their personal narratives. For the New Jersey senator, much of the day felt personal. In Brown Chapel he sat next to Jackson, for whom he cast his first ballot as an 18-year-old during Jackson’s 1988 presidential campaign. He later marched to the bridge alongside Jackson, their arms locked together. In his speech, Booker linked the 1965 Selma demonstration to the lawyer who volunteered to help his family buy a home in a white neighborhood after they were discriminated against and repeatedly denied. Brown, currently on a “Dignity of Work” tour inspired by King, returned to Selma for the fifth time. He frequently draws connections between civil rights and worker’s rights. A former secretary of state in Ohio, Brown also has a reputation as a leader on expanding voter participation. Sanders attended the 1963 March on Washington, which featured the Rev. Martin Luther King Jr.’s “I Have A Dream” speech. Sanders has highlighted his civil rights and activist background as a young man at the University of Chicago. He is working to strengthen his relationship with black voters, with whom he struggled to connect in the 2016 Democratic primary that Clinton won. Appearing at Chicago’s Navy Pier, Sanders on Sunday night recalled his work with the campus chapter of the Congress of Racial Equality, protesting discrimination and housing segregation. He led one of the first sit-ins in the North and was arrested at a demonstration against segregation in Chicago schools in 1963. Sanders said while the Chicago activism was significant at the time, it didn’t compare to what was happening in the South. “I must say that it is incomprehensible to me that, in the year 2019, we continue to have a president, a Supreme Court and Republican governors who still are trying to deny people of color and poor people the right to vote,” he said. In Selma, Clinton told those at Brown Chapel that the absence of crucial parts of the Voting Rights Act contributed to her 2016 loss to Trump. The Supreme Court in 2013 struck down a part of the law that required the Justice Department to scrutinize states with a history of racial discrimination in voting. Clinton said “it makes a really big difference” and warned of the need for continued vigilance about voter suppression heading into the 2020 election. The backdrop of Selma provides a spotlight on voting rights. Advocates say the gains achieved as a result of “Bloody Sunday” have been threatened in recent years, particularly by the 2013 Supreme Court decision.